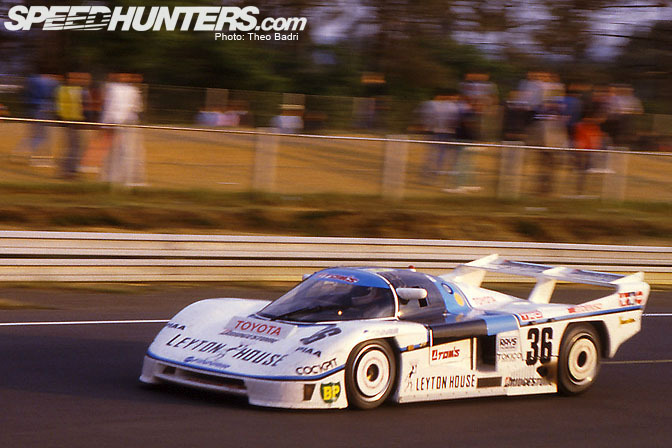 The Tom´s 85C blasts through the Dunlop Curve during 1985 running of the 24 hours of Le Mans. Piloted by Satoru Nakajima, Masanori Sekiya, and Kaoru Hoshino, they would go on to finish 12th, 44 laps behind the winning Joest Porsche. I’ve dug up a some pictures of the 1985 Toyota 85C from my stack of Theo Badri photos. 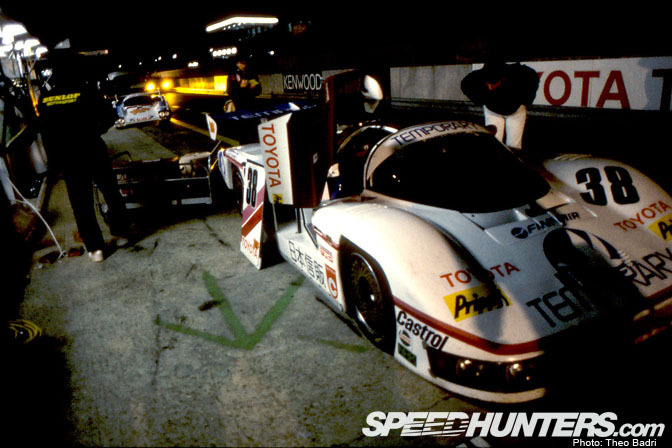 These were some Toyota’s early attempts at the 24H at La Sarthe; an effort which culminated with a 2nd place finish in 1999 with the awesome TS020 GT-One machine. I’ve heard rumours that Toyota will be returning to Le Mans in the coming years with some kind of Hybrid machine. Let’s hope these rumours become a reality soon! 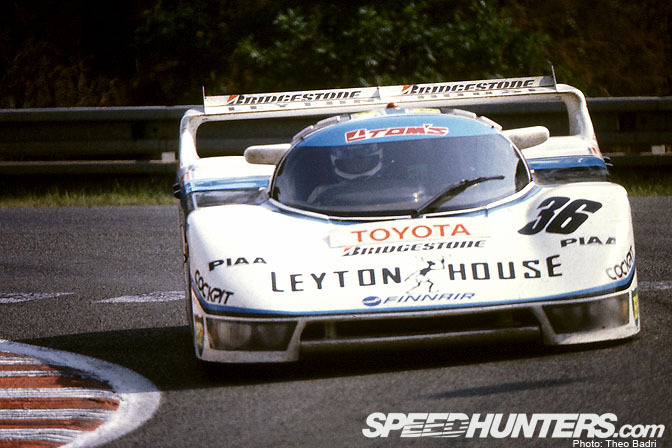 The second 85C was entered by the Dome team and driven by Eje Elgh, Geoff Lees and Toshio Suzuki. It retired after 141 laps with clutch failure. 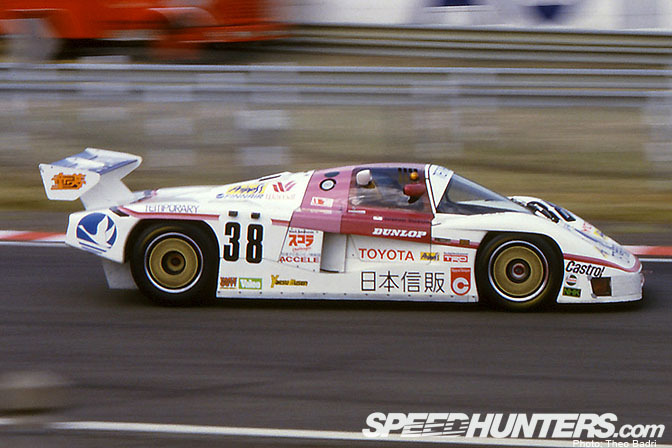 Dome built Toyota’s first Group C car in 1982, it was made to resemble a Celica GT (!). 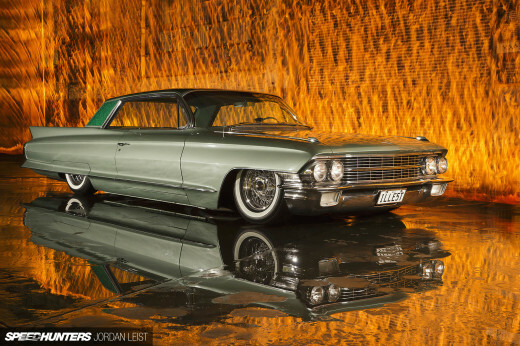 Any one have pictures of this car? The Tom’s car during the Thursday qualifying session. They ended up 29th on the grid with a time of 03:48.67. Theo snapped this picture in the pit lane after the Wednesday night practice session. The 85C was powered by a turbocharged 4T-GT 8 valve engine running to a 2090cc displacement. 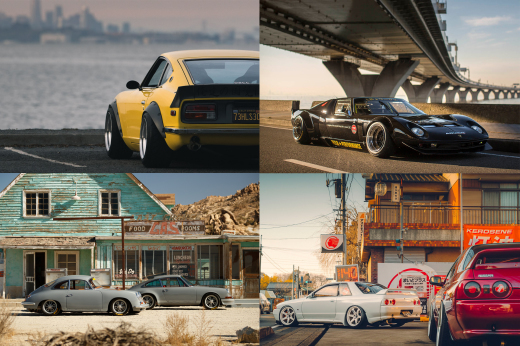 It was rated at 503 bhp. Tom’s car in the Ford Chicane. The 85C was the third evolution of the Dome chassis. 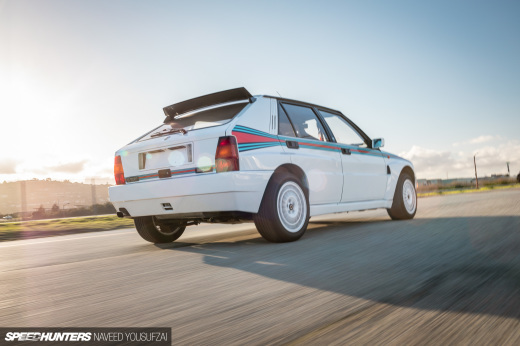 It was built right down to the weight limit: a featherweight 850kg. Almost there! The Tom’s entered car rounds Mulsanne Corner on it’s second day of racing at Le Mans. 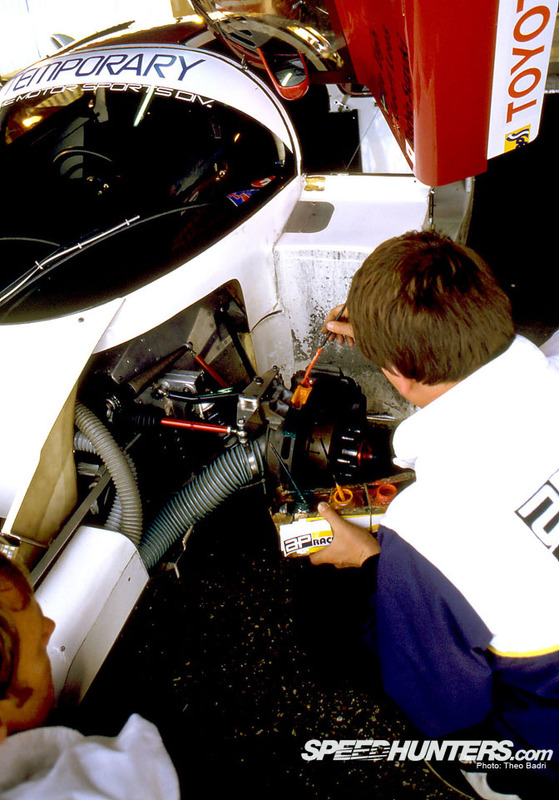 A mechanic err uh… paints the brake discs…. having a creative moment perhaps? Needing to express his inner artist? On the picture with the caption about how the car was at the minimum weight I see a sponsor sticker "Rays". Is that from Rays engineering? That is awesome if it is. Wow. I love all the old pics!!!!! Takes me back! Keep them coming! the reason on applying paint on the disc brake is to identify how hot or cold the disc are running. interesting, why the different colours then? Different properies of paint react differently to various temps perhaps? Walter H: Yes, it's the old RAYS logo, same company who makes Volk Racing. I used to have an old set of mesh wheels that had this old Rays logo. But I sold them in 2000 or 2001 cause the offset wasn't deep enough. Maybe I shoulda kept em, I've never seen a set for sale since then. Rod: THANKS for posting! I'm a HUGE fan of Toyota Team Toms, and about a year ago, Calvin gave me an old original sticker sheet from their Le Mans team. I have no idea where he got it, but you can be sure I put it to good use, on my vintage Tom's and TRD stickered/stenciled hard case... It looks like the TRD/Tom's version of my lens case, but older looking and smaller. I think you'll love it, it's stylish and cool as hell. The rotor paint will change colors, and depending on the color change, the highest operating temperature can be determined. These days we use stickers with little thermometers on them to gauge temps. They look kinda like the little power gauge on batteries.